Place tomatoes, cut-side up, on a foil-lined baking sheet. Sprinkle with kosher salt. Brush oil over tomatoes and roast on middle rack of oven 10 minutes. Add peppers to baking sheet and roast peppers, with tomatoes, an additional 10 minutes. Mash avocado with lime juice and chopped cilantro. Season with kosher salt. Oil grill grates and quickly grill beef, 1-2 minutes per side for medium rare. Let beef rest 10 minutes then thinly slice against the grain. As beef rests, heat 1 teaspoon canola oil in skillet. In batches, fry tortillas on both sides in medium hot oil until they are golden brown, adding additional oil if pan becomes dry. Let drain on paper towels. 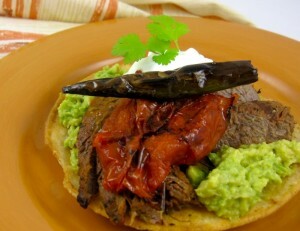 To serve, evenly divide and spread the avocado mixture on each tortilla. Top each with sliced beef, then top with a roasted tomato half. Garnish each with 1/2 tablespoon sour cream, cilantro sprig and a roasted pepper. *Any sliced or shredded cooked beef, pork or chicken may be substituted for the pre-seasoned Beef Carnitas I purchased from Trader Joes.